During the 18th century, at the height of Rococo culture, Giacomo Casanova charmed the ladies and enjoyed his earthly affairs as he traveled across Europe. Set in Venice, the city of water against the Adriatic Sea, a new story of adventure unfolds for Casanova, who dreamed of freedom and longed for true love. Commanding the affection of womankind, Casanova's myriad of scandals has caused him to be prosecuted and shackled by the Venice Political Offense Inquest Office for the crime of sorcery for fraud and womanizing. 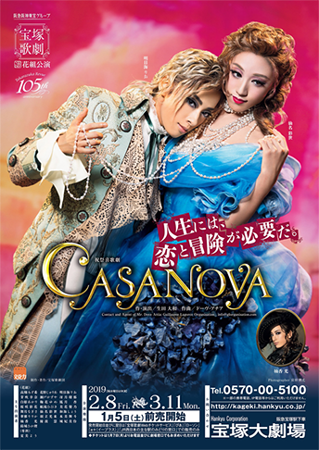 However, Casanova in pursuit of love and adventure, maps out an intricate plan and finally breaks out of prison. As Casanova tries to flee from Venice under cover of the chaos of the carnival, it is revealed to him by the hand of God that he will encounter life-changing love on his way to Milano. The love of his life, his femme fatale, was Beatrice, the niece of the governor of Venice. Having completed her studies at a convent, book-loving Beatrice was a progressive woman who was hesitant to lead the preordained life of a girl born into the aristocracy. Highly conscientious, Beatrice harbored hostility against the scandalous Casanova until she met him without knowing that he was Casanova and became attracted to his free spirit. "Life needs love and adventure"—bound by nothing but himself, where does Casanova find an end to his journey of love for women and freedom? Final performance for top musumeyaku Senna Ayase as well as Hanano Juria, Ousaki Ayaka, Aomiya Ruka, Marei Sayana and Rinka Mone. Final performance with Flower Troupe for Houzuki An and Maisora Hitomi before their transfers to Moon and Star Troupe, respectively. Natsuha Kotori was absent from the entire run due to poor health. Created by lokai. Last Modification: Thursday 18 of April, 2019 09:23:02 PDT by caithion.